Recovering from injury, with stiff, weak or sore ankles? The 1000 Mile Support Sock provides firm support and targeted compression. 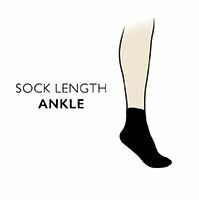 These ankle length socks are designed in five fits for male and female sizings (denoted by the colour of the toe seam) and assist in the prevention, treatment and rehabilitation of ankle and rear foot injuries, including sprains, achilles tendonitis, or plantar fasciitis. The blend of cotton rich fibres and inclusion of Tactel® in the fabric provides breathability and moisture management to keep feet and ankles fresh and dry. A flat toe seam is used to maximise comfort. "Twin layer 'anti-friction' construction protects against blisters; Shaped padding in toe, ball and heel area; Extended heel, ankle and Achilles protection; Vented mesh upper "